Move over Tesla, there is another company making headlines in the electric vehicles industry. 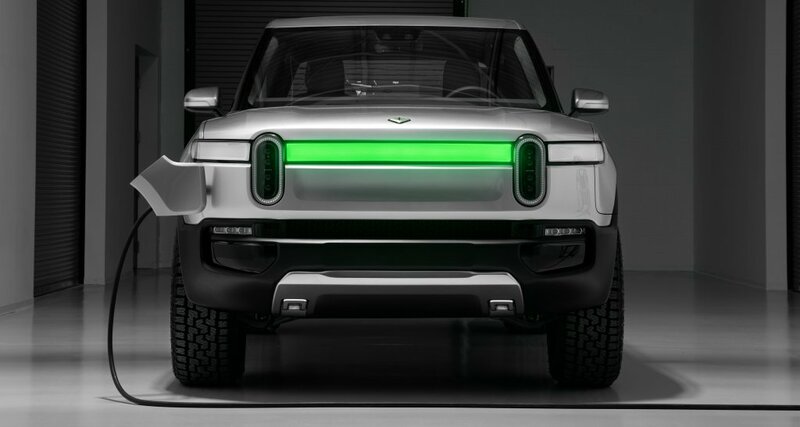 Rivian is a new American electric-car startup brand that is aiming to reinvent the segments its vehicles will enter. Stop me if I sound like a broken record. However, Rivian isn’t just building concept cars or prototypes – they are going straight to market with the first all-electric pick-up truck. The R1T is a futuristic looking crew-cab pickup that Rivian is claiming will be the world’s most aerodynamic truck. It’s equipped with 4 electric motors, each a 147 kW power capacity at the wheel, while the total power output can be configured to different levels from 300 kW to 562 kW. The front end is dominated by two oval-shaped LED light housings and a unibrow-like central light bar (which turns green and “fills up” as the truck is charging), and there’s no real grille to be found. At the back, there’s a single, large LED strip and prominent badging. No matter the battery pack you choose, the R1T’s capabilities remain the same. Every version of the R1T will have a maximum payload of 1764 pounds, which almost matches the highest payload achievable by the new Ford Ranger. Rivian says that every R1T is able to tow 11,000 pounds—that’s only a couple thousand pounds off from what full-size trucks like the Ford F-150 and Ram 1500 can achieve. The truck is a 5-seater and it has a ton of enclosed storage space. The front trunk, or “frunk”, is much large than a traditional trunk and Rivian also designed another storage space behind the back seat called a “gear tunnel”. The trucks are scheduled to hit the market in 2021 and can be reserved now for a $1,000 refundable deposit. They will retail at $69,000 for the base model.